5-1. 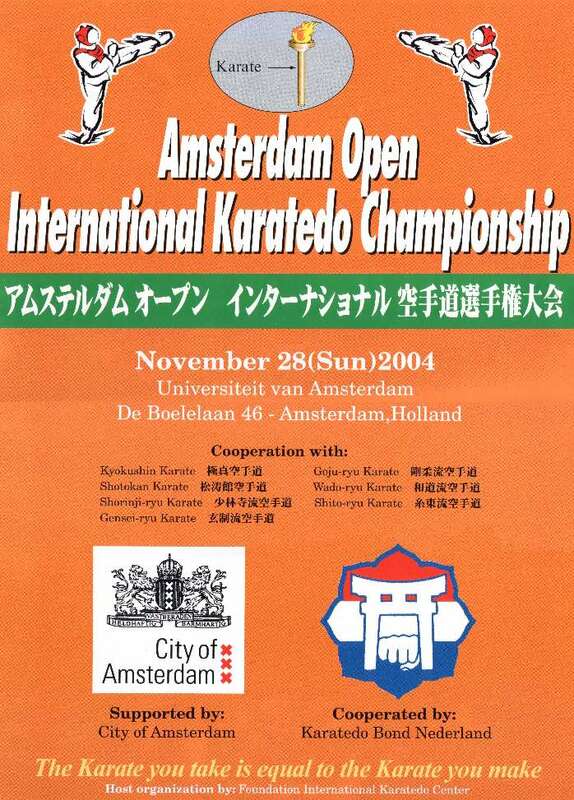 Promotion Poster for the Amsterdam Open Karatedo Championship, held on 28 November 2004. Participants at this championship came from several schools from Holland but also from Denmark and France and even 'all the way' from Japan and Australia! 5-2. 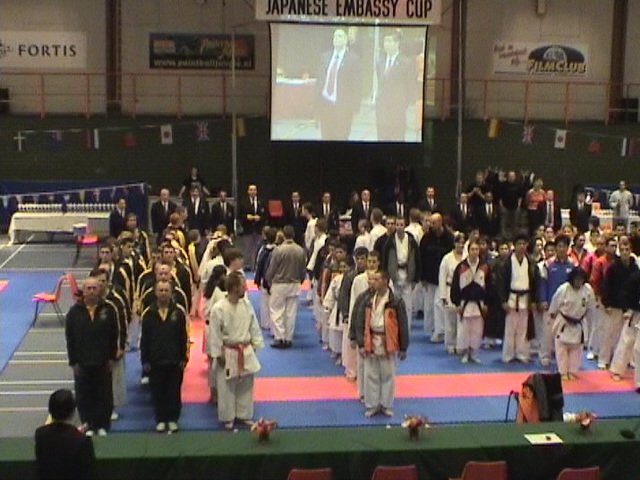 Opening of the tournament. 5-3. 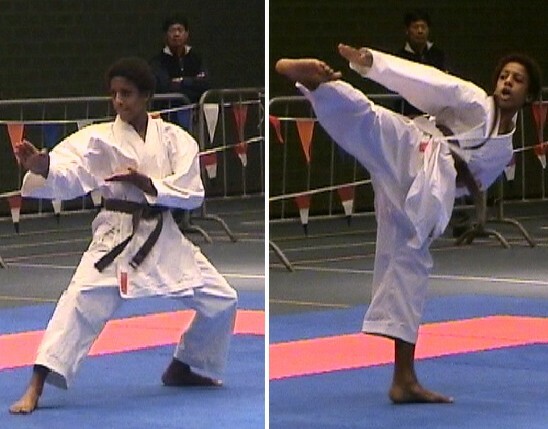 Maurice Tehi doing the Chi-i no Kata. 5-4. 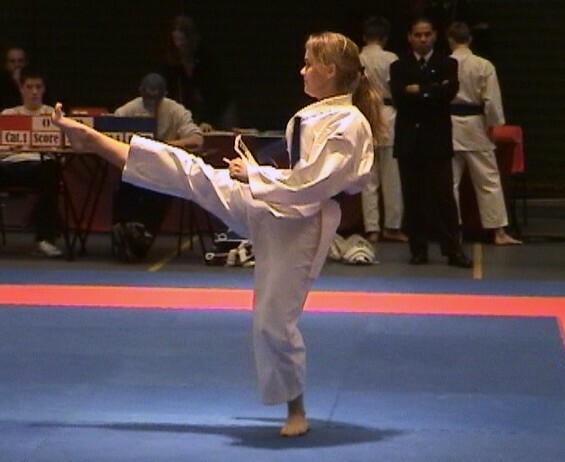 Melanie Hertogh showing a beautiful Mae-geri in the Kata Sansai. 4-5. 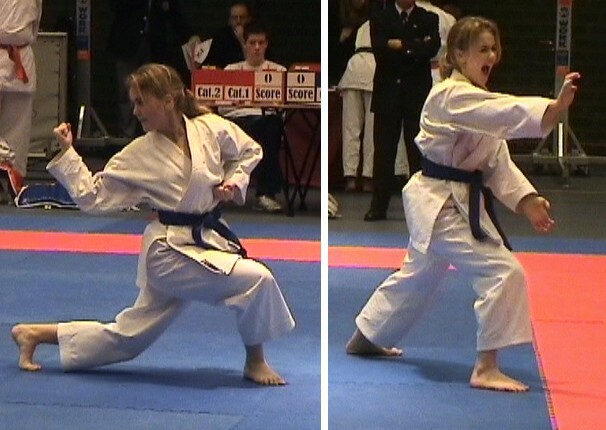 Melanie Hertogh and some more of her Sansai no Kata. 5-6. 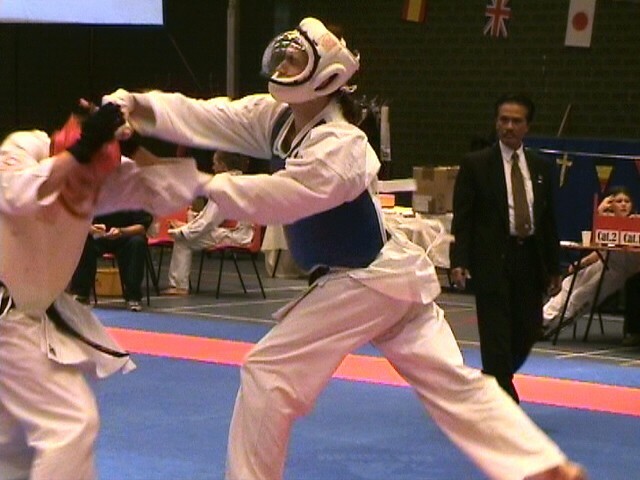 Joost v. Bruggen (blue) in a hot Kumite match. 5-7. 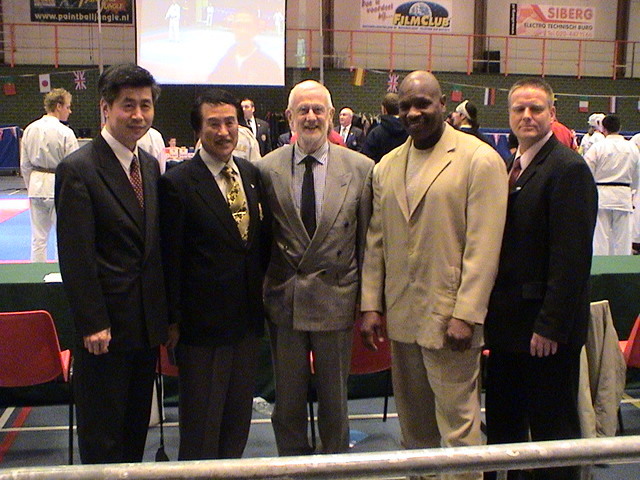 From left to right: Sensei Nobuaki Konno (Genseiryu Netherlands, co-organiser of the Tournament), Sensei Chiba (9th Dan Goju-Ryu, co-organiser of the Tournament, Sensei Rob Zwartjes (founder Wado Ryu Netherlands), Ludwig Kotzebue oud-wereldkampioen Karate (Wado Ryu) and Sensei Wim Keijl (co-organiser of the Tournament). 5-8. 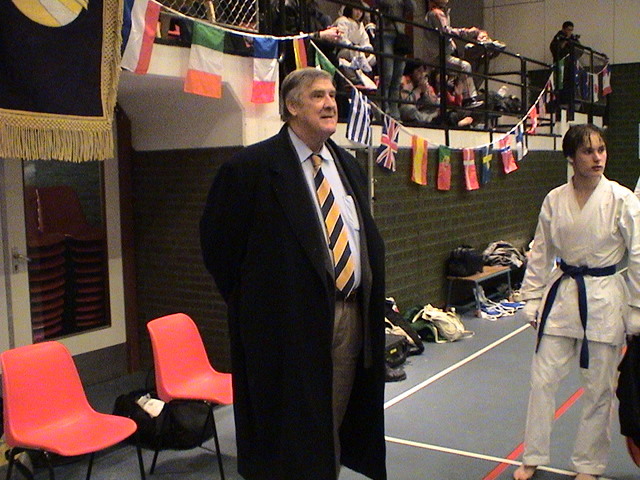 Later on that day, we were honoured by a visit of the Judo legend Anton Geesink, the first non-Japanese to win a world championship in Judo, winner of Olympic Gold in Tokyo (1964) and more than once Dutch, European and World Champion Judo. 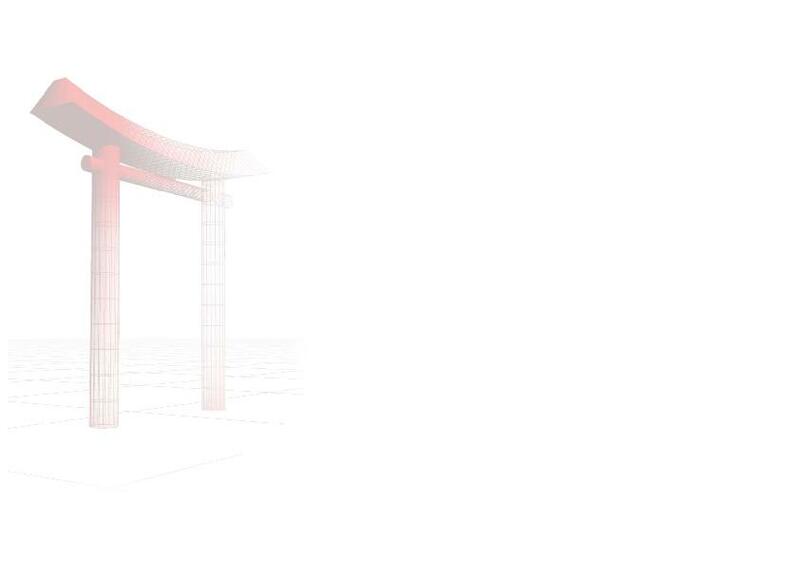 He is the only still living holder of the 10th Dan in Judo. Anton Geesink is a member of the board of the Dutch National Olympic Committee, and a member of the International Olympic Committee (IOC). 5-9. Of course with such a legend 'in the house', everybody wants to get a picture of themselves, together with the famous Anton Geesink. 5-11. Talking about... Karate, of course! 5-13. 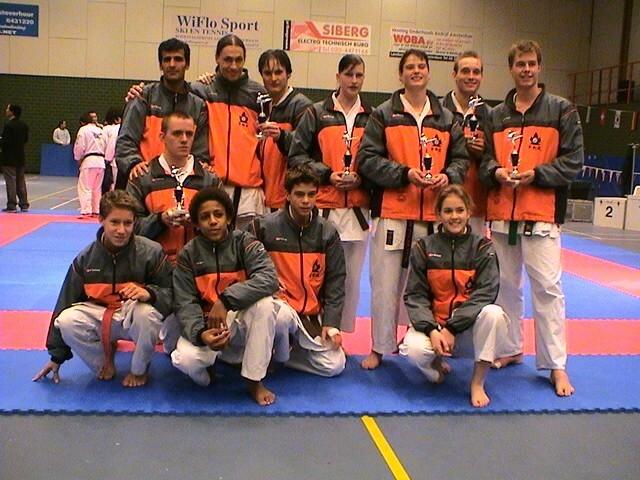 Group picture of (most of) the participants of the KLM Karateclub Amstelveen and Anna Paulowna. 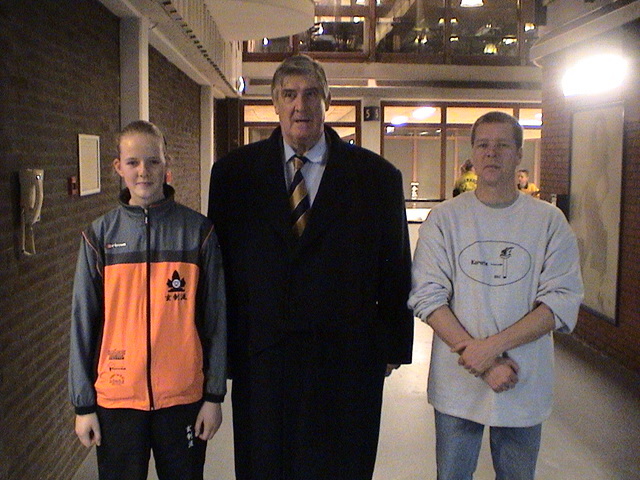 From left to right on the top row: Ali Dogan, Joost van Bruggen, Jeroen v.d. Berg, Sharon Appelman, Ciska van der Voort, Bert v.d. 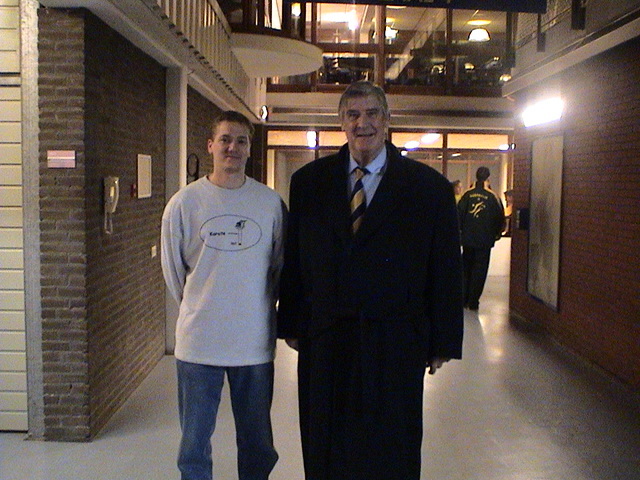 Pal and Richard de Waard. Kneeling: Mike Brouwer, Pluk Bakker, Maurice Tehi, Ryan Zwart and Melanie Hertogh. 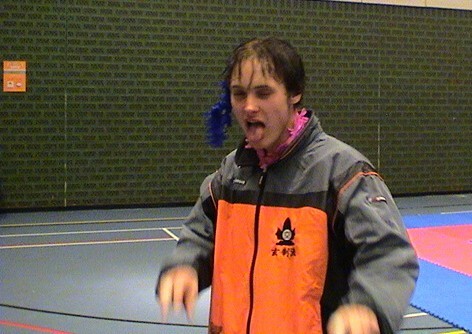 Voor de uitslag van de wedstrijden, klik hier!